With the wrap of Pro Tour San-Juan we can finally take a look at the top performing block constructed decks at the tournament. The results show a dynamic field with plenty of options and play styles. Additional deck list analysis from Chaos Wins! can be found here and here. The top performers and deck archetypes that reveled themselves in the constructed portion of the event are outlined below. This deck was all over the top of the Swiss at Pro Tour-San Juan. It's a straightforward deck with efficient green beaters, mana ramp, and then augmentation spells that make them gargantuan, indestructible and/or flying. I like how this decklist can quickly ramp out to 4 mana and beyond and flood the battlefield with creatures before finishing with a bang. Leatherback Baloth out of the board can foil decks with lighter creatures. River Boa punishes blue. It's a surprisingly simple deck that can just generate enormous threats very quickly and overwhelm an opponent trying to develop their defenses. This one didn't perform as well as ascension did, but it was just as prevalent. Nothing fancy here. Just quick goblins backed by burn and late reach spells to finish. I found Kitesail to be an interesting if inelegant sideboard choice (but apparently effective). Ruinblasters are boarded in to foil control decks. This is your gold plated control deck. Pretty standard UW fare here. Permission spells, Wrath of God board sweeping, card draw and library manipulation and then fat finishers late game. Reminds me of "The Deck" by Brian Weismann played way back in 1996. An assortment of hate comes out of the board. Kor Firewalker stifles Red Deck Wins. Luminarch ascension for the mirror. 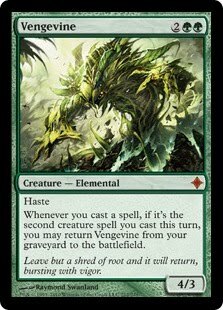 Vapor Snare is standard fare against quality creature decks. UG Ramp was also very successful. A simplified if potentially more efficient version of the RUG deck while slightly more complex than mono green ascension. It combined quality green creatures with permission spells and Jace for card draw and library manipulation effects. Additional creature control elements come in from the board including the powerful Vapor Snare to beat down the mono green variant on this deck. Vampires didn't get a whole lot of help from Rise of Eldrazi, but it still had a presence in the field because it had so much power from Zendikar and Worldwake. There were several variations on the theme, but the above incarnation created by Lukas Jaklovsky was one of the most successful. The deck uses efficient black vampires and quality black removal. Mind sludge, if not countered, usually means game over if board position is established. Vampires was a force pre Eldrazi and it's good to see that it's still viable in this format. That's a good look at the competitive decks in this block constructed format. A good mix of mono colored creature rush and multi colored control variants. Zendikar block constructed will be a healthy format for casual kitchen table play for years to come. 0 Response to "Block Constructed Magic: Zendikar Block Constructed Part 3"